The Federal Aviation Administration has announced the furloughing of almost 3,000 air safety inspectors as part of the government shutdown. 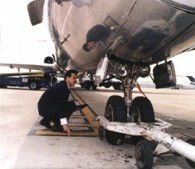 The job of the inspectors is to ensure that airlines and general aviation aircraft are keeping up with planes’ maintenance; to perform inspections on the planes and pilots; and to visit the sites that airlines use to repair aircraft, both domestically and overseas. So, it seems these inspectors are considered non-essential for the safety of traveling public ! The cutbacks were so stringent — 3,000 workers sent on furlough — that some officials initially thought the FAA had made a mistake, but FAA Administrator Michael P. Huerta said it’s no error: The inspection force in fact had been targeted for the furloughs. Hopefully this is just games politicians play, and its temporary.